Israel's High Court is reviewing a petition over 20 Eritreans blocked by the new border fence from illegally entering from Egypt last week. Israel's High Court is reviewing a petition over 20 Eritrean would-be infiltrators who were blocked by the new border fence from illegally entering the country from Egypt last week. The appeal, made on behalf of the hopeful migrants by Israeli NGO “We Are Refugees,” accuses Defense Minister Ehud Barak and Interior Minister Eli Yishai of refusing to allow the Eritreans to apply for political asylum. The group has been stranded in a no-man's land on the border with Egypt between the fences of the two countries since last Thursday. The NGO claimed in its petition that the area between the two fences is technically within the sovereign borders of the State of Israel – thus forcing the Jewish State to accept responsibility for the lives of the would-be migrants. The group reportedly includes men, women and a 14-year-old boy. Media reports quoting soldiers stationed at the site claimed the Eritreans have not eaten in a week and have been given only a limited supply of water, according to the AFP news agency. "Israel's refusal to provide them with food, medical treatment, and to hear their asylum request is a clear violation of the 1951 U.N. Refugee Convention, which Jewish organizations helped draft in the aftermath of World War II, and Israel was the fourth country to ratify," the NGO said. Citing information allegedly provided by soldiers, "We Are Refugees" added the minor was "in serious condition, that a pregnant woman miscarried and that the group has not received food since last Thursday." It was not clear whether the information came from Israeli or Egyptian soldiers. The would-be migrants are sitting near the Israeli community of Be'er Milcha. Israel ruled out entry for the illegals on Wednesday, who have been camping out on the border for almost a week despite the Jewish State's public crackdown on migrants who walk across the porous frontier. 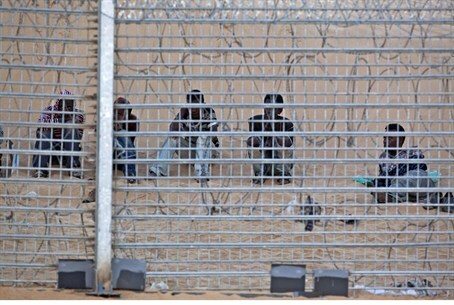 The fence along the 260 kilometer (160 mile)-long frontier with Egypt's Sinai Peninsula, which is still being built and is due to completed by the end of the year, is among the measures introduced by Israel to bar African migrants. "The attorney general ruled today that there is no legal obligation to take in anyone located beyond the border," said a statement from the Interior Ministry issued Wednesday. "According to international practices and binding precedents, the fence is a de facto border, and therefore anyone who is beyond it is not located in Israeli territory and is therefore not eligible for automatic entry," a government spokesman said on condition of anonymity. "There has been no determination by any international body according to which Sudanese or Eritrean citizens are persecuted in Egypt or that their lives are in danger. Therefore, there is no legal obligation to allow entry into Israel of those who are near the fence." The most recent government figures indicate there are some 60,000 Africans living illegally in Israel, most of them from Sudan and Eritrea. In recent months, a major campaign to round up and deport illegal African migrants has sparked an outcry from some leftist organizations. However, the move has also brought a sigh of relief from numerous municipalities and local authorities, whose underfunded social welfare and services have been severely stressed by the rising population of illegal aliens.